Law’s Allure: How Law Shapes, Constrains, Saves, and Kills Politics, by Gordon Silverstein. Cambridge University Press 2009. ISBN-10: 0521721083; ISBN-13: 9780521721080. Winner of the C. Herman Pritchett Prize for the best book published in the field of law and courts in 2009 from the Law & Courts Section of the American Political Science Association. Judicial and political power are inextricably linked in America, but by the time John Roberts and Samuel Alito joined the Supreme Court, that link seemed more important, more significant, and more pervasive than ever before. From war powers to abortion, from tobacco to integration, from the environment to campaign finance, Americans increasingly turn away from the political tools of negotiation, bargaining, and persuasion to embrace what they have come to believe is a more effective, more efficient, and even more just world of formal rules, automated procedures, litigation, and judicial decision-making. Using more than ten controversial policy case studies, Law’s Allure: How Law Shapes, Constrains, Saves, and Kills Politics draws a roadmap to help politicians, litigators, judges, policy advocates, and those who study them understand the motives and incentives that encourage efforts to legalize, formalize, and judicialize the political process and American public policy, as well as the risks and rewards these choices can generate. 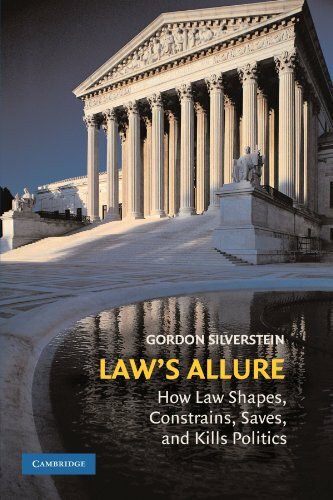 In Law’s Allure, Gordon Silverstein explains the risks and rewards of America’s increasing reliance on litigation, judicial decisions, and formal legal rules to achieve political and policy goals, drawing a map that helps explain how, when, and why law and judicial rulings shape, constrain, save, and sometimes even kill politics. Gordon Silverstein is Assistant Professor of Political Science at the University of California, Berkeley. A former journalist with a PhD from Harvard University, Professor Silverstein also has taught at Rice University, Dartmouth College, Lewis & Clark College, and the University of Minnesota. Silverstein has written a number of articles and book chapters on American politics, the separation of powers, and judicial power in comparative perspective and is the author of Imbalance of Powers: Constitutional Interpretation and the Making of American Foreign Policy (1996).